Do you know the ammonites? Ammonoidea appeared, 300 millions of years ago in the Devonian age, resulting from an archaic form named Batritide. From this moment, they did not cease diversifying (except some biological crises). 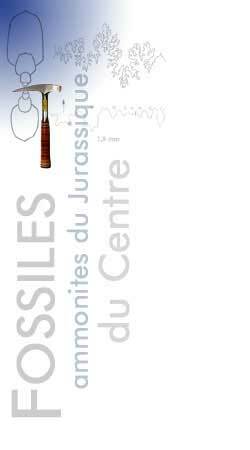 There were three broad groups : the goniatites of Devonian and Carboniferous age, the ceratites of the Permian and Triassic age and the ammonites flourishing during the Jurassic and the Cretaceous ages. But the number of genera and species considerably descreased from the Cretaceous period onwards. Finally, the ammonites died out 65 M.y. ago, in the Maastrichtian stage, just like other groups of Cretaceous fauna. Among them also the dinosaurs were. From a protoconch (the equivalent of a larva), the animal probably used its coat to complete the walls (septa), little by little, (approximately twelve per annum) in order to built the chambers. They were connected by a siphuncle, the body was always in the last chamber. At the adult stage, the walls were tightened and was then formed a real body chamber in which the soft body of the animal placed. By way of comparison, it takes approximately three years for the current nautilus to become adult. 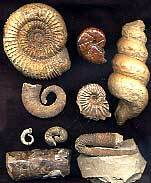 Ammonites were very polymorphic molluscs. The coils of the shells may be arranged in plane spiral or in a spiral reminiscent of the gastropods (helicoid). Other species are uncoiled... 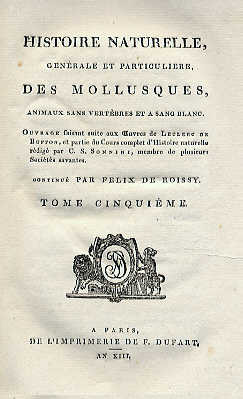 The way of life probably influenced the shape of the shell. Two centuries after the French paleontologists de Blainville, d' Orbigny and Munier-Chalmas suggested the possibility of a sexual dimorphism in ammonites, the work of Makowski and Callomon (1963) finally confirmed this concept. The terms macroconch (M) and microconch (m) are used for two shells of a pair. When complete, the microconch, probaly the male, had lappets and the macroconh (the femal) a simple aperture. The ammonites make it possible to date the geological deposits in which one find them. Some species existed for only short time and they were very widespread. These two facts allow the use of this ammonites as biostratigraphic markerst and zone index fossils. In the body-chamber of several species, there may be found two small calcareous plates which forming together the aptychus or one single, thin and horny plate, called anaptychus. The shape and the ornamentation of these fossils vary with the species to which they are related. They are thought to be a part of jaw mecanism or, may be, an operculum making it possible to close the shell. The opinions of the specialists are divided. The suture is the line of junction of the edge of a septum with the external shell of the phragmocone. Each species has its own distinctive suture . The largest ammonite, ever discovered, has a diameter of more than 2,50m . It belongs to the genera Parapuzosia of the upper Cretaceous.